This Caterpillar is initially green with pale stripes. Later the stripes are replaced by speckles with two bright yellow spots on the last abdominal segment. Mature instars mat be brown. Potato ( Solanum tuberosum, SOLANACEAE). Grass pasture ( POACEAE ). 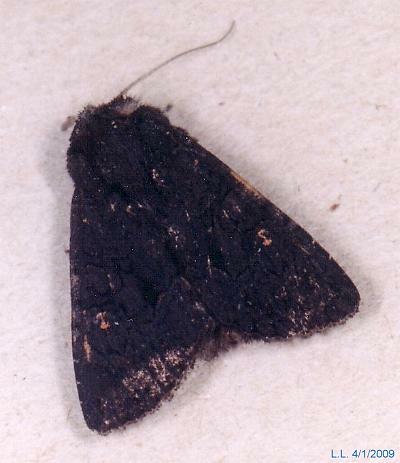 The forewings of the adult moth vary from dark brown to black. On the paler specimens, a pattern of light and dark brown may be discernible. The hind wings pale with wide black borders. It has a wingspan of about 4 cms. Butterflies and Moths, Collins Eyewitness Handbooks, Sydney 1992, p. 258. Moths of Australia, Melbourne University Press, 1990, pp. 65, 461, 465, 467. Flying Colours, New South Wales University Press, Sydney 1992, p. 76.